A friend persuaded me to try the company whose ad he had seen in his Facebook feed. Banggood.com offered "wholesale" men's fashions. "More bang for your buck" is one of their slogans. I'm not one to support environmentally ridiculous Chinese manufacturing (not to mention the conditions that their workers are forced to endure), but I had been under the weather, not able to go shopping, and I thought I'd try what appeared to be their military grade pants. The slick web page selling Banggood's poor quality clothing. Nearly a month later (sent from China by probably sent via the cheapest method possible) my pants arrived. 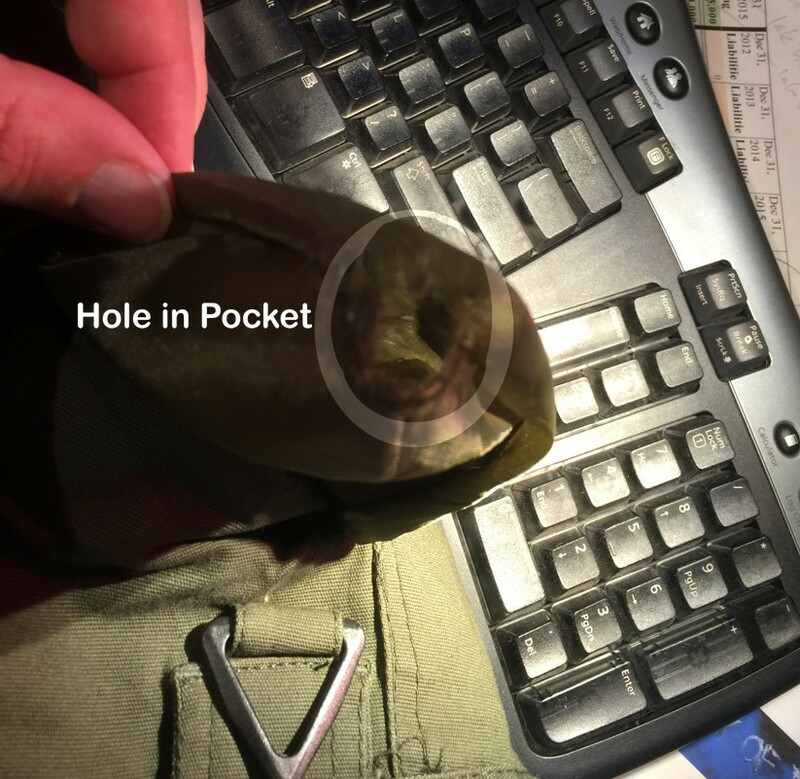 With a hole in the top left pocket. Not to mention the material was flimsy and there were loose ragged threads all over the pants. When I looked on their web page they said you had to report defects within a few days. I don't know how they enforce this as the packaging gave no indication of when it was shipped or received. Regardless, their web page asked for photos or video of any defects. I dutifully took photos and sent them. 3 days later, after not hearing anything - I sent a followup. 9 days later after no reply I threatened to contact Facebook, blog and tweet that they had been unresponsive after shipping a defective product. I got an apology letter saying it had been Chinese New Year and they were sorry for the delay (they give you 9 days off for Chinese New Year!!). It then took several more emails before I understood that the person communicating me had very little understanding of the English language and that what they wanted me to do was to photograph the pants with a tape measure (to demonstrate that the size was incorrect). A hole in the pocket of pants that arrived in the wrong size from Banggood. After I did this, there was another 5 day delay until I got this shocking response (and I quote). i so sorry the inconvenience for you,would you please sell this pants for us because the shipping pants is so expense.and if you like this pants,you could buy another one with $20.do you think so?hoping for your understanding. At this point, I had had it - sensing "a teachable moment" I felt it my responsibility to educate the Chinese on proper free market etiquette. When you sell a product with quality control problems it is not customary when doing business - to leave the mess and cost to the customer to clean up. This has already been an expense, waste of time and inconvenience for me. China is famous for this type of problem, I did not believe it was still happening - now I do. Your company's logic (I imagine it is a shortsighted, ill advised supervisor making you do this) dictates that you want me to sell your defective products to someone else to get the money to pay you more money in order to receive the pants I originally ordered in the proper size?! It is the job of a retailer to make sure their product is in order before selling it. Not the job of the customer to deal with your shoddy problems. CONGRATULATIONS! You have taken my money for something I have no use for, pants in the wrong size with a hole in the pocket but the good news is you can tell your manager you successfully saved your company the cost of replacing it's defective product. 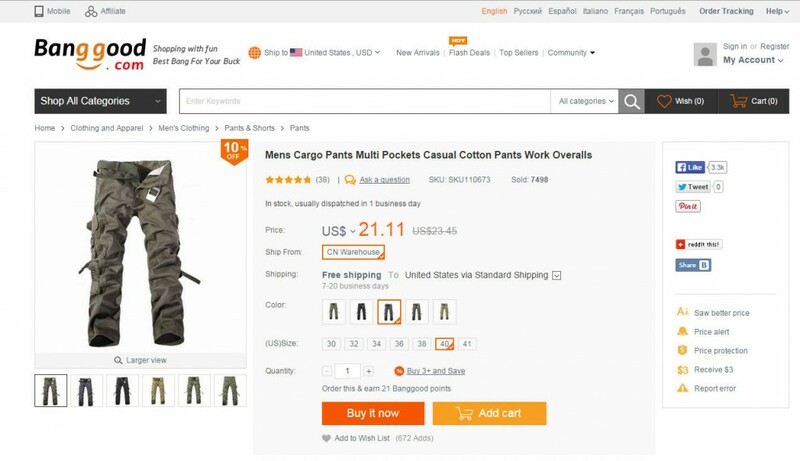 As a SEO specialist I will make sure that anyone searching for "reviews Banggood men's clothing" will find a blog story, YouTube video and web postings about how your company failed to execute enough quality control to sell pants in the proper size with a pocket without holes. As soon as I am done publicly posting the problems I have had with your product, I am done with you. Thanks for your kindly understanding,our customer service have get your a refund,please check it with your PayPal account within 48 hours. After you get the refund.could you please delete the reviews about us in the google? please get me a chance.and i learn this lesson and will deal with thing with more careful. so sorry to inconvenience casued. I did get finally get a refund through PayPal. Hopefully, they learned something. But I am done buying pants through the mail directly from China. I did not post any reviews on Google, just this blog (as mentioned in Rumun's email above), just this blog. We are sorry for sending you the faulty item ,I have checked your order #4614460 was refunded . If you need any other question ,please feel free to contact . I believe the subtext is: you got your money back so "no harm no foul" right? Wrong! Unable to make any contact. Order 53985462. Payment was confirmed. Missing are seventeen (17) dresses for a total of over $200.00. 53985462. Order number. Ordered 2018-09-01. I order 2 skirts, the picture was ankle length but the skirts arrived knee length. I found it impossible contacting BangGood, one was sent in circle and never was anything resolved. I’m contacting paypal for some resolution and to get my money back. i was about to order a bag which was being sold at 90% off. i was actually wondering what the catch is. how could one sell a product at 90% off? it seems too good to be true! this made me doubt and looked for review. thank God, i saw this blog. thanks for sharing. I once got cheated for hundreds of dollars by a Chinese camera merchant. Camera had only drivers for 32-bit Windows XP. So I did what you did – SEO-optimized blacklisting. Same story. They ignored it until they started to get damaged by it. Their owner asked me to remove it if he’d refund me. I asked him to refund me $200 extra for my time. He did. And he was very lucky I removed it, or the damage to his company would have been so great that he’d be bankrupted. They admitted to paypal.com that they refuse to refund the money to me, so I won the dispute. But I have to ship back to China, NOT to the place I purchased the collar from in the United States ( COMPTON, CA 90220 ) – It would cost me more than the collar, so I guess I am just screwed. But I am going to be sure to spread the word about the treatment you can expect from there company. How can your technicians can’t get an accurate diagnosis of a problem without physically inspecting & testing the product. I don’t have the ability to produce a video and upload to your system. SO I AM JUST OUT MY MONEY. That is fine I just started spreading the word online and with my friends about this treatment. You demand a video or no refund? You can send a return label like most online shops and when you receive the item back you will see the item is defective. You obviously make these types of demands so you don’t have to take returns. I ordered a phone in September 2015 !! They shipped -of course- the wrong phone. I needed to send it back (me paying). I received the correct phone (150 Euro), which worked for 1 week. I had to return it to China for repair, which costed again. Now we are 23rd of March, and still have no phone. Only ‘solly for the inconvenience’. PLEASE DO NOT ORDER AT BANGGOOD ! I note you bad experience with Banggood. Believe me it’s not restricted to clothing. Have just purchased as CNC printer. Printer arrived without power supply, unassembled, without assembly instructions, without any manual and with two damaged safety glasses. Up to now I have sent them more than thirty five emails. Their customer care is non existent and at par with the ability to communicate in English. I would not recommend Banggood even to my worst friends. Shop from Banggood at your own peril.